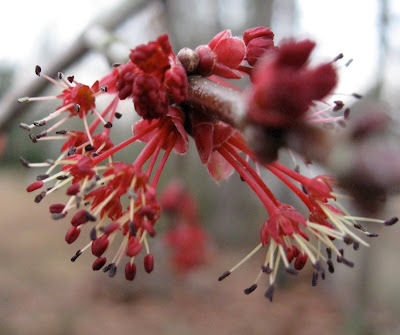 A quick trip outside before rain started this morning included a check on the progress of red maple blooms. They are a bit more dramatic than they were when I posted a photo in a Jan. 27 post. One of my two surviving blueberry bushes that I planted last spring also sport tiny red buds on bare twigs. These minute blooms and buds are giving hope that consistent sunshine and an opportunity to start work on our vegetable garden will arrive some day. Not yet though. We have not had enough rain-free weather since Christmas for our backyard swamp to dry, and weather reports predict rain will continue through tonight. I feel your pain about the backyard swamp! My husband is going stir crazy from being shut in every weekend, too. He's itching to get on his tractor again! Funny thing is--this summer we'll be prayin' for rain! Have a great weekend!